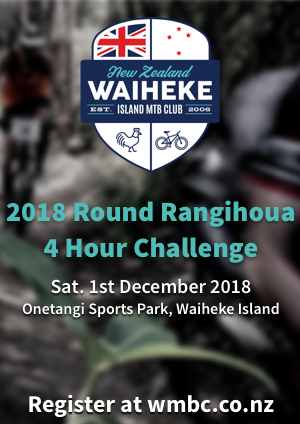 Waiheke Mountain Bike Club is pleased to announce the details for the 12th Annual ‘Round Rangihoua Challenge 2018. Come and join us on Saturday 1st December 2018 for the 4 hour Mountain Bike relay around Te Putiki o Kahu – Rangihoua Hill. Covering lots of lovely single track, the team race is suitable for all riding levels! A fun day out for everyone. The challenge is a 4 hour relay race for teams of up to 4 people. The track is cycleable by anyone with a moderate level of bike skills – in the main event is for anyone 12 and up, with the kids race for anyone up to 12. The track is suitable for almost all levels, from expert to novice. Get your team together, or ride solo! Timed event with prizes & giveaways. Events available for men, women and children. There’s something for everybody. Each rider rides a single loop at a time and riders change over by tapping his/her replacement on the top of their helmet. Now you can also do the race solo and there are prizes for different categories; boys, girls, women, age groups and single speed. For up to date information as it happens, hit like on the WMBC Facebook page, or the ‘Round Rangihoua Event page. Where: Onetangi Sports Park, Waiheke Island on Sat 1st December 2018.
Who: Solo or team riders. Cost: $30 in advance $40 on the day (per rider). This entry was posted in Events, Latest News by Nic Wise. Bookmark the permalink.